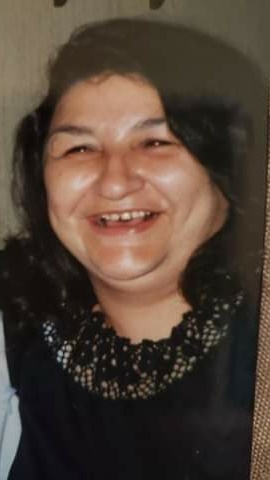 Katherine Veronica (Pookum) “Kate” McArthur, Ginu Equay “Golden Eagle Woman,” 68 years old, of the Turtle Mountain Tribe and Detroit Lakes, Minnesota entered the spirit world on November 30th, 2018. She was born to Roy Peltier and Ernestine Louise (Villneauve) in Belcourt, ND on October 2, 1950. Kate was truly loved by all who knew her. She was a kind and loving mother and homemaker most of her life, raising her children in Audubon, Bemidji, Fargo and Detroit Lakes. She was happy and fun loving to all her family near and far. Kate was a free spirit that loved Elvis, country and blues music, dancing and singing. She made the best frybread and mac soup and will be missed by all who knew and loved her. Family that Kate is reunited with are her parents; Roy Peltier and Ernestine Louise Villneauve, grandparents; Rachael and Alfred Villneauve, brothers; Bradley Okstad, Kenneth Peltier-Morin, Effy Peltier-Morin, Richard Boone, sister; Delores, grandson; Kody and many aunts, uncles and cousins. She leaves behind her daughters; Desiree Stebe, Dominique Greenfeather, Donita McArthur, Robin Peltier, brothers; Brian Peltier, Myron Okstad, Eldon Okstad, Richard Okstad, Pierre Okstad, Randall Peltier, sisters; Sharon McKenna, Bonita Manzi, Faith Littlewolf, grandchildren; Breanna, Deacota, Keanna, Hanneah, Kohv, Mikah, Landyn, Milani, Cody and 8 great grandchildren. A wake for Kate will begin at 4:00 p.m., Tuesday, December 4th and continue until her 11:00 a.m. traditional service on Thursday, December 6th all being held at the New Mission Center in Cass Lake, MN. Allen Hardy will be her spiritual Advisor. Pallbearers for Kate will be, Eldon Okstad, Richard Okstad, Pierre Okstad, Landyn Seaboy, Elvis Smith, Mikah Seaboy and Kohv Woehle. Her honorary pallbearers are Brian Peltier, Randall Peltier, Brian Stebe and Myron Okstad. Interment will be at a later date.